For many years, I’ve been nervous about cooking chicken, and I’m not entirely sure why. I really like chicken (especially dark meat, not gonna lie), and I ate loads of it growing up (thanks, Mom!). Since I’m working on adding some great easy, tasty proteins to my weekly menu, a roasted chicken that can be added to just about anything seemed like a good thing to try. This one’s good solo, but it can also be a salad topper, a frittata protein, whatever! This is a super-easy recipe that will give you several servings of protein to use at will during the week… enjoy! Position rack in the center of the oven and preheat to 400 degrees F.
Line a large rimmed baking sheet with aluminum foil, overlapping edges. Place the chicken legs on the baking sheet, skin side up. 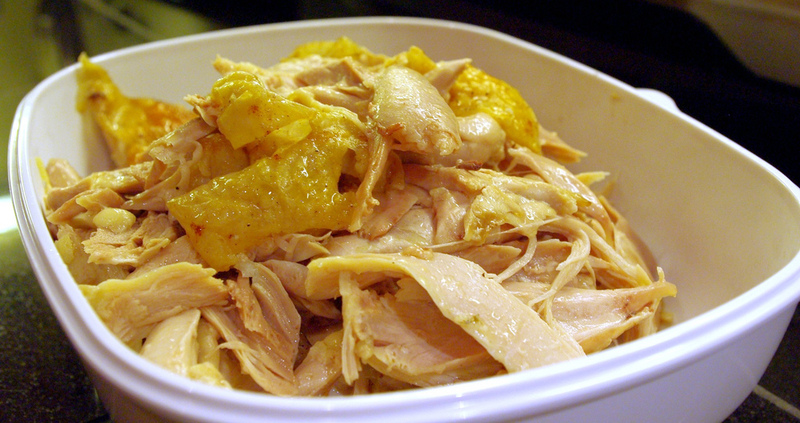 Drizzle with olive oil and squeeze both lemons on chicken pieces. Sprinkle with the paprika, thyme, salt, and pepper. Remove meat and skin from the bones and shred by hand. Eat as-is or throw into your favorite recipe! Would you eat the skin too?